• JCB’s EcoMAX T4 Final/Stage IV engine is offered here in two sizes. The 4.4 litre delivers 125hp (93kW) and a massive 550Nm torque at low engine speeds. For ultimate performance, there’s our new 145hp (108kW) 4.8 litre variant with 560Nm torque. • 4WD is standard, so good traction is assured on your AGRI Loadall. Optional 2WD is available at the flick of a switch too, minimising tyre wear and fuel use when roading. For ultimate traction, choose a limited slip differential (LSD). • A selectable transmission dump on the foot brake allows superb multi-functioning and increased power during loading or rehandling with your telehandler. • To improve productivity even more, we’ve now fitted an Auxiliary Venting button for quicker attachment changes on the front hydraulic auxiliary service. • Regenerative hydraulics help to ensure the very fastest cycle times, keeping farm output high. • Our brand-new Auto Smoothride System (SRS) engages at speeds of 4km/h and above, improving load retention on the road or on uneven fields for increased comfort (and therefore productivity). You can manually select SRS with the boom in any position. • Variable geometry turbo (VGT) technology minimises lag for excellent telescopic handler performance at low revs. VGT also delivers excellent speed pick-up and superior efficiency at higher revs. • There are plenty of options to tailor your 550-80 to different applications. These include tyres, hitches, LED Lights, heated screens and a larger 5m³ bulk handling bucket. • JCB’s new Auto Bucket Control system makes it easier to meter out or fully empty material from your bucket or muck fork via a feature button on the joystick. Material is ejected quickly and in a controlled way. • AGRI Loadalls have three selectable steer modes. There’s two-wheel steer, which is ideal for high speed on the road; four-wheel steer for tight spaces; and crab-steer for maneuvring close to walls and farm buildings. Operators can switch modes on the move without having to line the wheels up. • Joystick-mounted manual or automatic gear changes mean you can shift gears, speed and direction quickly and easily with one ergonomic control. • Boom End Damping is fitted to the boom’s lift and retract functions, for a smoother cycle and reduced material loss. • The AGRI Loadall is extremely manoeuvrable; the compact wheelbase and large steering lock angles save you valuable time, especially where space is limited. • Whichever engine your 550-80 Agri Loadall is fitted with, you’ll benefit from a hydraulic variable speed cooling fan as standard. This automatically reacts to ambient temperature, adjusting the fan speed for maximum economy and reduced noise. • The engine can be remapped to run on lower grade fuels, which means your telescopic handler can be resold across many different territories, with a corresponding boost to residual values. • JCB’s new hydraulic regeneration system uses a unique pilot-operated counterbalance valve to harness gravity, making lowering and retracting the boom more efficient than ever. The system reduces cycle times by up to 20% and fuel consumption by up to 4.4%. • We believe that even high performance features should have economy at their heart. That’s why our robust Z-bar linkage doesn’t just offer an incredible 6.5 tonnes of tearout force; it also maximises bucket fill for superb efficiency in rehandling applications. • The 550-80 telehandler boasts high back-off brakes; these reduce viscous drag during roading and rehandling, boosting economy by as much as 2%. • JCB’s innovative Clean Burn technology helps our engines to meet Tier 4 Final/Stage IV regulations without the use of a DPF. This means, of course, that costly DPF regeneration or replacement is never a worry. • All AGRI Loadall operators have access to all the fuel information they need via the dash LED screen. By pressing the information button, the driver can see fuel remaining, fuel used since the last fill-and-reset, and current average fuel consumption. Additionally the DEF/Adblue level is also easy to view on the same screen. • We’ve fitted a tough inverted U-shaped boom pressing with fully welded closing plates and large overlaps of over 1.0m. For extra strength, we’ve reduced the number of joints and stress points across our integrated boom nose and one-piece closing plate. • Heavy-duty axle feet help an AGRI Loadall to absorb the immense stresses generated during continuous heavy material re-handling applications. Keyhole castings hold the tilt and extension rams to further improve overall structural integrity. • The bonnet is side-mounted and recessed to keep it out of harm’s way. Rear lights on this telehandler fold up and away from potential hazards on-site. • The one-piece fully welded chassis maximises strength and minimises weight. The boom is mounted low in the chassis, providing an extremely rigid structure and maximum over-the-shoulder visibility. • Hydraulic hoses can be vulnerable to damage, so ours are intelligently routed through the boom for maximum protection. Our hydraulic cylinders have friction-welded eye-ends for extra strength, plus all pivots use hardened pins. • Because we make our own hydraulic rams, cabs, transmissions, engines, chassis and booms, JCB AGRI Loadalls benefit from perfect harmony of key components, bringing with it optimised reliability and performance. • The new AGRI Loadall range’s stringent testing programme has included prolonged high stress loading of the chassis, boom and other key components, as well as repeated transmission use over thousands of cycles and intensive rolling road work. • If you need added protection from falling objects, choose our front and top screen roof guards. • We use state-of-the-art manufacturing processes like robot machining, precision paint technology and innovative assembly techniques to achieve the very highest levels of quality. • To provide long-term corrosion protection, we dip our cabs in electrophoretic alloy before starting the painting process. • JCB engines are tried and tested. We’ve built over 200,000 DIESELMAX engines since 2004, and we’ve tested our latest EcoMAX units for 110,000 hours in 70 different machines across the toughest applications and environments. • The Tier 4 Final/Stage IV engine builds on the proven success of the JCB EcoMAX platform. Since the start of the engine program we have achieved over 200,000 hours of testing across the toughest applications and environments. • Single-lever servo-assisted electro hydraulic controls provide fully proportional, smooth, precise command of both boom and auxiliary functions on the 550-80. The single lever control can be either cab or seat mounted, ensuring the best controllability on the market. • Shifting gears and changing the direction of your telehandler is done via the joystick, making manoeuvres fast and easy. A tilting steering column with optional telescopic adjustment helps operators to find the best possible driving position. • For intuitive automotive-style ergonomics (and, therefore, greater usability), we’ve fitted our latest AGRI Loadalls with new instruments, a hi-res TFT screen and backlit switches. Operators can now enjoy at-a-glance instrument recognition and improved visibility even at night. • Our 7-speed fan heater has plenty of scope for adjustment; this helps to create a more comfortable – and therefore productive – operator environment. • All-round visibility on JCB AGRI Loadalls is excellent, courtesy of direct glazing and a large roof screen, as well as a low bonnet. • A new exterior top door slam latch means you can now close the upper door from outside. • Optional front and rear worklights give good all-round illumination, while our optional LED lights allow ultimate productivity in the dark. We even offer a rear hitch worklight option. • The new-look exterior isn’t purely cosmetic; the cooling fan airflow is now angled upwards, reducing dust build-up. The EcoMAX’s DPF-free design keeps the bonnet line low for maximum visibility. • As standard on Agri Loadalls, the deluxe cab trim gives you extra rear seat storage and a cubby box mounted to the off-side rear of the seat. • A tilting and optionally telescopic steering column facilitates a fully adjustable driving position creating an optimal ergonomic environment, aided by excellent airflow, low noise levels and optional air conditioning. • Control is increased even further with automotive-inspired braking. This new system sees already class-leading braking performance enhanced with the introduction of power brakes, providing proportional braking throughout the pedal travel and resulting in improved braking effort and safe, stable stopping. • Adaptive Load Control technology automatically controls hydraulic operation, helping to maintain the longitudinal stability. An AGRI Loadall also has hose burst check valves (HBCVs) to protect the rams from collapse in the event of a hose failure. • Excellent cab access, with three points of contact and ergonomically positioned grab handles and two footsteps. Bystanders are safeguarded by our standard-fit reversing alarm. • The low boom profile and pivot means that operators get excellent rear visibility; there’s also a full set of side and rear-view mirrors to enhance all-round visibility and safety compliance. • Accidental operation is a thing of the past with our operator presence switch; this feature prevents telehandler movement whenever drivers leave their seats. • Our factory-fit immobilisers can reduce your insurance premiums. They can be activated by a JCB unique key or a 4-digit keypad, with automatic arming after a set time following engine shutdown. • Depending on territory, our AGRI Loadall security system is Thatcham-approved. 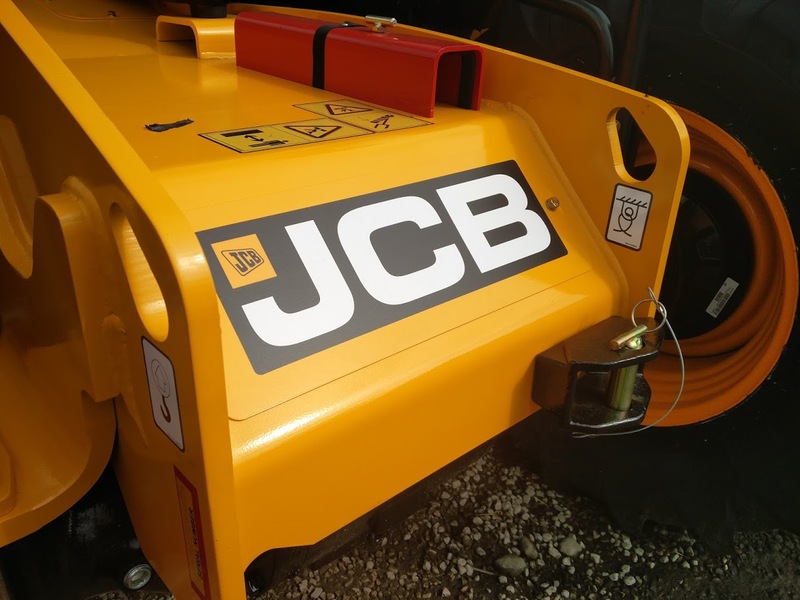 The package comprises a JCB LiveLink telematics vehicle tracker, an immobiliser and a Cesar Datatag (UK only). • All daily checks and grease points are easily located at ground level on these AGRI Loadalls; specify our optional central greasing system for even faster and easier serviceability. • The bonnet opens and closes easily with gas-assisted cylinders, and the service bay is large and wide for good engine access. The battery is protected by a hinged bolt shut door, which nevertheless offers easy access to the battery itself. • Filling both the telehandler’s diesel and AdBlue/DEF tanks is straightforward and can be done from ground level; there’s also an integral pre-filter in the filler neck to guard against contaminated fuel. Housed inside the DEF tank are DEF quality sensors. • A dry lubricant system means wear pads are extremely durable, with service intervals of 500 hours. • The filters on these AGRI Loadalls (engine oil, hydraulic oil and fuel) are centrally located for fast, easy servicing. The air filter is easily accessible, and its double-element design simplifies cleaning. • The battery is protected by a hinged bolt shut door still giving easy access to the battery. As a product of the JCB Efficient Design programme, the 550-80 AGRI Loadall is a telehandler that can make the most of every last drop of fuel. The transmission and hydraulics are exceptionally well matched to ensure that the Tier 4 Final JCB EcoMAX engine can produce high torque at engine speeds as low as 1500-1600rpm. And it meets Tier 4 Final regulations without requiring costly or time-consuming exhaust after-treatment. Further efficiency-boosting features on these telescopic handlers include easy servicing, a transmission dump on the footbrake, superb traction, a new hydraulic regeneration system, variable geometry turbo technology and excellent manoeuvrability even in confined areas. The hydraulic system alone has helped to reduce cycle times by up to 20% and fuel consumption by up to 4.4%.